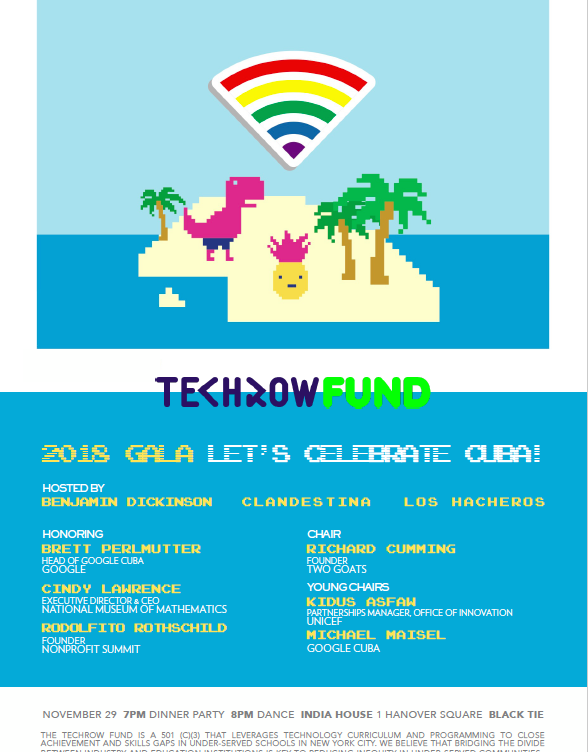 TECHROW FUND The 2018 Gala // Let's Celebrate Cuba! Join us for an evening of Cuban beats, immersion and impact for the launch of TechRow Fund’s annual Gala. Google Cuba will feature a virtual reality experience on Cuba and panel discussion, followed by a black-tie dinner and live performance by Los Hacheros. TechRow Fund believes that immersive technology and experiential learning are powerful connectivity tools that encourage cultural exchange and learning. TechRow Fund partners with educators and community organizations in NYC to pioneer innovative and immersive technology programs that enable under-served students to discover the world. Your support will provide students across New York City with access to technology skills and life-changing learning opportunities. SELECT Members receive 50% off tickets with code "SELECT".